Sentinel Battlemace is an epic Battlemage item card. It is part of the Core Set. 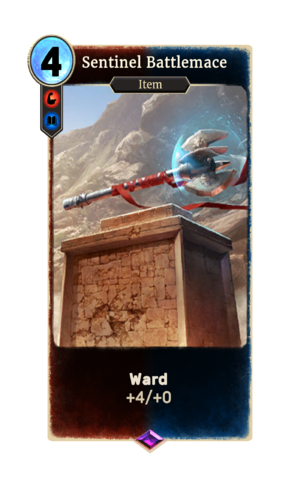 The card is named for the Hammerfell city of Sentinel. The card was originally named "Shimmering Scimitar" in prerelease materials, but by the time of open beta it was renamed "Sentinel Battlemace" and had Breakthrough dropped, and the original art was used for Steel Scimitar.